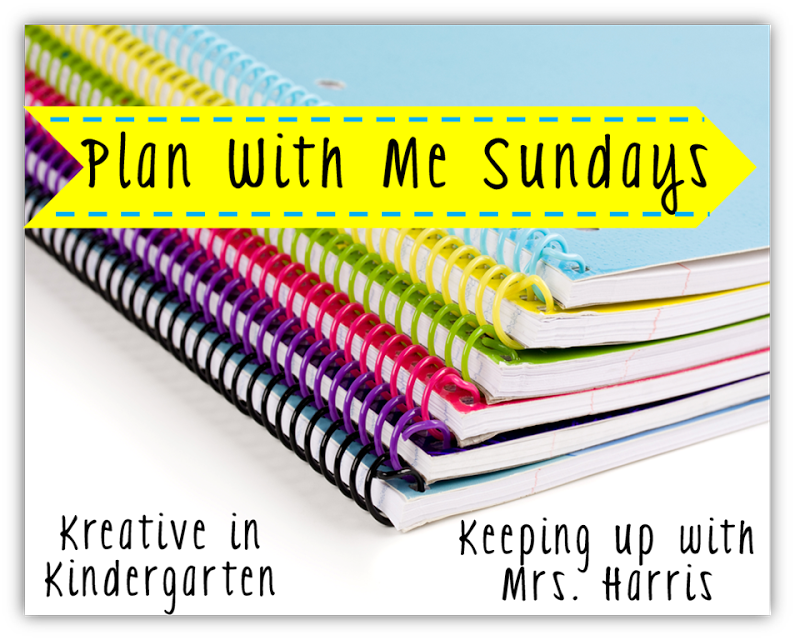 I am joining Robyn of Kreative in Kindergarten and Meghan of Keeping up with Mrs. Harris for Plan With Me Sundays (yes I know today is Tuesday, but I've had a busy week). 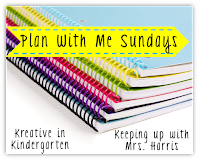 I wasn't sure I wanted to participate since my planner use really doesn't start until the school year, but I figured I have "technically" started and this weeks' post is about supplies. Those I can talk about. I tend to have an AWESOME planner the first week of school...and then it all just gets lost. This school year I am making an effort to do better! I tend to plan in four different places, my phone, my e-mail (Outlook), my desk calendar, and my school planner. Outlook I am more or less stuck with because my bosses use it and I need to mark when I am busy there so people know when to schedule appointments. My desk calendar is key for big items, but not day to day. My phone is awesome, but sometimes having things in writing is just best. Normally, my school planner isn't much to look at, but this year I moved into a new classroom and am really trying to make it homey. I got some awesome black and white wrapping paper from the dollar store and have used it for accents around my room. It covers part of my podium, is the background of my wallpaper, and acts as the border for the class bulletin boards. I used this to add some color to my free "weekly lesson plan" notebook the school gives every year. I can't show the inside of the planner because I don't know my schedule for another few weeks. Until then all I can really do is play with the cover and wait. So, my yet-to-be-completed cheap-o school planner. I am a big fan of school spirit, so dollar bin gold tape and blue rewards stars rim the edges. I also LOVE stickers (who doesn't?). I grab mine from all over the place. Sometimes I grab them from Michael's, The Dollar Tree, Target and of course a small store called The Grossmont Nutrition Center that always has random stuff. I haven't doodled it yet, so it is rather plain. I like to leave my covers relatively unfinished so when I bring them into meetings I have something to doodle. I am a strong believer in the power of doodling. I do HAVE favorite pens for planning, but will admit that since this comes with me home and to school, I usually use whatever is on hand. I am a HUGE fan of highlighters, not only for focusing on important ideas, but also for color coding. I teach five different classes and work after school. All of these are on rotating schedules, so I like knowing that I can match one color to a specific class or activity. For big things like headers, (or marking days off) I am a huge fan of chalk markers. They don't seem to bleed through as much as other markers, don't have that marker-y smell, and seem to be rather pigmented. These Beary Genius ones also come with reversible tips so I can have some freedom with the size of lines. These work great on any surface, but they really pop on chalkboard labels. You can find chalkboard labels all over the place, but I LOVE these from Chalkola. The neon colors really pop and they have tons of fun shapes I can play with that make my planner more fun to use thus, I actually use them! I also tend to use a lot of sticky notes. These are however for less permanent things. For example, if I know a student is very sick, I may put a post-it in my planner for a week from when I find out that reminds me to send a letter, or call home if they still haven't showed up. Once I've done that I throw the sticky out, so it doesn't mess with anything else. Stickies are basically my code for, "This is something you need to handle ASAP and it will take you less than five minutes." That's pretty much it. Hopefully as the year progresses I'll have a chance to share what the inside looks like and you'll be able to laugh as you see the development of the cover of my planner as it goes through numerous meetings. Love the black and white. I can't believe that wrapping paper is from the dollar store-- way to be wise with your money! I also love that hint to use post-its to remind yourself of things that take very little time to do-- just do it! I still use to-do lists (of course) but the post its just seem to work for some things I want to be sure I get done. What to watch when lesson planning?